If one knows the process and historical context of Factum I and Factum II (1957) of painter Robert Rauschenberg they have an ‘in’. Otherwise, these two pieces can read like examples of abstract expressionism, medium specificity, and collage, when in fact these pieces are comments on these practices; they are reactionary. Of course one can still view the work without knowing the process, but does one understand the point of it? Does it matter? I must state, though, that explanations (superfluous artist statements) are contradictory to my own beliefs on authorial intent and inhibit a pure reading of the text by the viewer. It is the viewer (an individual of the larger audience) who completes the work. I am aware, and battle with the fact, that this is not always possible with conceptual work. Sometimes, a viewer must be given an ‘in’. However, conceptual work itself does not function properly in this insular, art-v.-craft-v.-design framework for education. One must prove the merits of one’s concept – but the notion of ‘concept’ in this model has a depth of a slip-n-slide. Traditional forms of artistic expression have been dropped from curriculums while design- and commercial-oriented programs are becoming more specific and highly funded. Common core standards, or the collegiate equivalents, must be met; boxes checked and funding secured. Shared gallery spaces are overtaken by machines made for production, replacing the celebration of the handmade with the celebration of technology. One must now create in terms of ‘market viability’. It is the commodifuckation and career-oriented New Art World. My work does not fit in this model. My work exists as a discussion of and about process; metal fabrication is only fraction of the ongoing discourse. I am not a jeweler. I am an artist who works through the totality of my process (writing, reading, thinking, and making) who happens to have a portion of said process that falls into the realm working with metal. I read, I write, I think, I make. I read. I write. I think. I make. I am not a jeweler. I do not make ‘jewelry’. I feel like I have to define what I am by what I am not. I dislike having to define what I am by what I am not. I am forced to define what I am by what I am not. 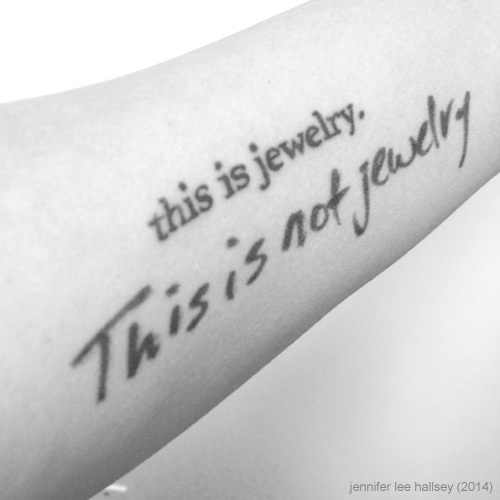 Photo: The betrayal of words (this is jewelry), 2014, tattoo, + sharpie marker (Saturday, 11 October 2014).